At the concert we went to at the Fillmore to see Lee Michaels, the main act was the Moody Blues, and the opening act was Argent, a new group led by Rod Argent formerly of the Zombies, who wrote their hit songs. So we got to hear “She’s Not There,” “Time of the Season,” and “Tell Her No.” And of course, there was that drum solo I loved so much, especially when the drummer stopped for a nano-second to pull off his shirt. I was 14 and impressionable. But it obviously stuck with me. We were excited beforehand. Our first real concert. The Fillmore. We were on the phone, my friend and I, discussing just this. “I can’t wait to hear ‘Never Going Back to Georgia,” I said. 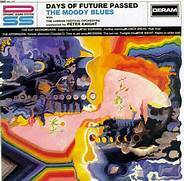 My brother came into the room and bluntly informed me that I wouldn’t be hearing that song at all because we were going to see the Moody Blues and NOT the Blues Magoos, who were the ones that did that particular song. Life was so confusing. I didn’t expect this to be a good workout album, but surprisingly, and pleasantly so, it was. It is actually now on the Ram alternative contender list. I’ve got to start writing that down. In any case, it’s an interesting themed album, each song representing a time of day, in order. It starts with an overture and combines wonderfully orchestrated music, English 60s rock ‘n roll, poetry and flute. Nothing mundane about it. This was the record that the concert promoted. It was post Denny Laine, who had left the Moody Blues to join Paul McCartney’s Wings, making room for Justin Hayward, a lovely looking lad who was responsible for probably their biggest hit songs “Tuesday Afternoon” and the beautiful and haunting “Nights in White Satin.” I would say that both songs are now classics, and I wouldn’t be surprised if I hear “Tuesday Afternoon” tomorrow. “Nights in White Satin” will last forever. I don’t recall if we got to hear it in concert before Mrs. R. came to get us. I wonder if my friend does.